Jaw - form the basis of the facial skeleton. The upper jaw (maxilla) - steam room bone is composed of body and four appendixes: forehead, cheekbones, palatal and alveolar. Inside the body of the upper jaw is a large pneumatic sinus maxillary sinus, lined with a mucous membrane. The bottom close to the tips of the roots of the second premolar, first and second molars. The upper jaw is still connected to other bones of the skull. Right and left Palatine processes, when combined, form the front of the hard palate. Alveolar bone has cells (alveoli) for the roots of teeth. On the front surface of the body jaw is a small hollow, so-called dog hole at the upper boundary of its offer infraorbital the hole that goes infraorbital nerve (Fig. 1). Fig. 1. 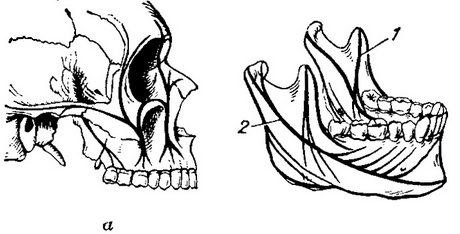 Maxillary bone structure: a - front-external surface; b - the inner surface. 1 - the frontal bone; 2 - infraorbital eye; 3 - anterior nasal spine; 4 - alveolar exaltation; 5 - hill maxillary bones; 6 - zygomatic process; 7 - infraorbital furrow; 8 - ophthalmic surface; 9 - lacrimal groove; 10 - opening of the maxillary sinus; 11 - the Palatine apophysis; 12 - shell comb. 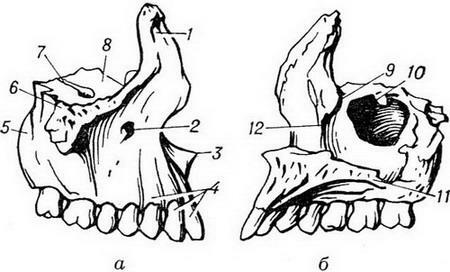 The lower jaw (mandibula) - Gypsy bone with a pronounced layer compact matter, movably connected with the bones of the skull and consists of a u-shaped body, alveolar part two branches, departing from the body at an obtuse angle. Each branch has two bone, joint and coronary separated by cutting the lower jaw. On the inner surface of the branches of the jaw is a hole - the entrance to the lower channel, in which is located the neurovascular bundle. On the outer surface of the body jaw in its anterior are mental exaltation, are located posterior to the same hole leading into mandibular canal. On the upper edge of the alveolar jaw holes - dental alveoli. To jaw attached a large number of muscles (Fig. 2). The blood supply is mainly maxillary artery and its branches. The outflow of venous blood goes through the system of pozavcherashny and facial veins. The regional lymph nodes jaw - submandibular, popodrobnee, which primarily metastasize some malignant tumors of the jaws. Innervation of the upper jaw at the expense of the second branch, and the lower jaw is the third branch of the trigeminal nerve. Fig. 2. The lower jaw and place of attachment of the muscles to it: and - the outer surface (side view); - the internal surface of the right half of the lower jaw. 1 - coronary process; 2 - chin tubercle: 3 - chin eye; 4 - the angle of the mandible; 5 - articular process; 6 temporomandibular eye; 7 - chelyustnitza line; 8 - submandibular hole; 9 - sublingual hole; I - the place of attachment of the chewing muscles; II - temporal muscle; III - lateral pterygoid muscles; IV - medial pterygoid muscles; V - oral sublingual muscles; VI - digastric muscle; VII - chin-sublingual muscles; VIII - chin-speaking muscles. Jaw (from the Greek. gnathos - jaw; lat. maxilla - top, mandibula - lower jaw) - bone basis of the middle and lower parts of the face. The lower jaw presents unmatched mandibular bone, top - two pair maxillary bones. In relation to other bones of the skull upper jaw fixed, lower jaw mobile. Together with the surrounding muscles, ligaments and other soft tissues of the jaw provide the fulfillment of the chewing function and participate in the implementation of speech in humans. Development and age peculiarities. Bookmarks jaws are formed in the early stages of development of a human embryo. By the end of the second month of fetal development completes the accretion of maxillary and frontal processes that form the average Department of the face. In the thick of them appears six points of ossification of which is the ossification first palatal processes and lateral parts of the upper jaw, then the Central Department as an independent tool bones (os incisivum), which later merged with the maxillary bones. Violation of this Union leads to the formation of congenital cleft palate (see). The development of the lower jaw begins with education several points of ossification, located in the soft tissues around mechkereva cartilage. Last cartilage is the basis of the first visceral arc of the embryo. Bone is formed around mechkereva cartilage, which is gradually reduced. Rear departments of the jaws are formed independently of the cartilage of the corresponding points of ossification. 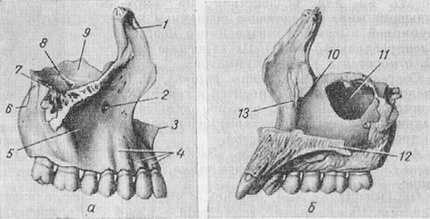 The ossification of the two halves of the lower jaw ends of their Union, i.e. transformation into unpaired bone that is already occurring after birth, by the end of the first year of life. Fig. 1. Age-related changes of the jaws: and - jaw newborn; - a child 6 years; adult; Mr. senile jaw. In the thickness of the emerging jaws are formed and developed the beginnings of teeth. With the development and teething closely related to the growth and formation of the jaws. Age characteristics; (Fig. 1). The newborn jaw poorly time Vita. The upper jaw, short and wide, consists mainly of alveolar process with located in it the beginnings of teeth. Maxillary sinus small size. The lower jaw has developed the alveolar; the body is represented by a narrow jaw bone strip. Branches short, wide with well-defined articular and coronary processes. Further growth of the jaw bones is uneven. The most intensive it during teething. The growth and formation of the jaw and its branches mainly ends to 15-17 years of life, when completed teething and the formation of permanent teeth. So later eruption of third molars, especially in the lower jaw, accompanied by complications associated with lack of space for them in the back parts of the alveolar arches - the so-called shortness eruption of wisdom teeth. With the development of the maxillary sinuses and the formation of the nasal passages upper jaw increases in volume. Bone wall of the maxillary sinus become thin. Both halves of the upper jaw in the middle line incorporate a strong seam. Hard palate, almost flat in newborns, acquires the adult form of the dome. The shape of the lower jaw is also varies significantly in the growth process. After birth is increased growth of the body of the mandible, the size of which increase by approximately 4 times, while the size of the alveolar ridge is less than 2 times. 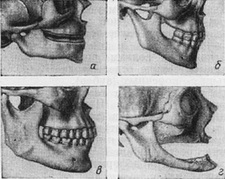 The greatest changes occur in the branches of the lower jaw, which have increased in length accompanied by a change of the angle between them and the body of the jaw; a very blunt the child (140 degrees)angle becomes more acute in the adult (105 - 110 degrees). The main areas of growth of the lower jaw are rear parts of the body jaw (the area of large molars), corners and branches jaw and articular process. The defeat of these sites (trauma, inflammation, arthritis) in children lead to the violation of the growth of the lower jaw with the formation of deformations (microgenia). In old age due to loss of teeth observed progressive atrophy of alveolar process, reduced their height, almost to extinction; the hard palate becomes flat. Decreases and body height of the lower jaw, the angle becomes more blunt, increases the protruding chin. Anatomy and histology. In the upper jaw, in General, easy, air, formed thin slices, restrictive airway and cavities are formed more dense areas of compact matter, providing increased strength of the bone in the areas of greatest tension from chewing pressure, which are called the buttresses (Fig. 2, a). Fig. 2. Buttresses (indicated with a bold line) and the upper jaw (a) and trajectory strength of the lower jaw (b): 1 - temporal trajectory; 2 - tooth trajectory. The lower jaw is the only mobile-bone of the facial skeleton. It attaches a significant number of muscles, providing a complex and diverse. Conditions functional load of the lower jaw determine its structural features. The lower jaw has developed layer of compact matter, but especially the lower edge of the body of the jaw, in the area of its corners and branches, articular processes in the places of attachment of muscles. More thin, the compact disc is in the area of holes teeth. Cancellous bone forms a different form and size of the cells filled with bone marrow. The bone structure of the jaws in the development process acquires a certain orientation, situated in accordance with the direction and distribution of functional duties, the so-called path (Fig. 2, b). Fig. 3. Maxillary bone (a - front-external surface; - interior): 1 - processus moreover; 2 - foramen infraorbitale; 3 - spina nasalis ant. ; 4 - juga alveolaria; 5 - crista zygomatico-alveolaris; tuber maxillae; 7 - processus zygomaticus; 8 - sulcus infraorbitalis; 9 - facies orbitalis; 10 - sulcus lacrimalis; 11 - hiatus maxillaris; 12 - processus palatinus; 13 - crista conchalis. The upper jaw (Fig. 3) consists of the body and four appendixes. On her body (corpus maxillae) distinguish four surface. The top, or ophthalmic, surface (facies orbitalis) forms the lower wall of the eye. The front surface of the jaw (facies ant.) in the lower Department goes without special border to the outer surface of the alveolar ridge, where there are a number of hills, corresponding to the position of the roots of the teeth (juga alveolaria). Almost in the centre of the front surface of the body of the jaw is deepening (fossa canina) - a dog is a pit", "klicova burrow". At the upper boundary of the holes is infraorbital hole (foramen infraorbitale), through which extends infraorbital nerve (n. infraorbitalis). Nasal surface of the body jaw (facies nasalis), converted into the nasal cavity, enters the upper surface of the Palatine apophysis (processus palatinus). These processes of two maxillary bones together with the horizontal palatal plate of the bones form the bottom of the nose and the skeleton of the hard palate. In the upper part of the nasal body surface jaw has a large hole (0.5-1 cm in diameter) - hiatus maxillaris through which the nasal cavity communicates with the maxillary sinus. Naruzhno-lateral surface of the body upper jaw facing the apex and the wing-palatal fossa (facies infratemporalis). The lower back part of this surface the most convex - hill upper jaw (tuber maxillae). On this surface there are small holes through which the vessels and nerves to large indigenous teeth. Inside the body of the upper jaw is a large pneumatic cavity, the largest of the sinuses. Adult it takes almost the whole volume of the body jaw, leaving only a thin plates, serving its walls (see Accessory sinuses of the nose). Alveolar bone of the upper jaw (processus alveolaris) free his side has holes - holes for the roots of the teeth (alveoli dentales). Between wells have partitions (septa interalveolaria). Zygomatic process (processus zygomaticus) upper jaw is connected with the zygomatic bone. Frontal bone (processus moreover) connected by joints with the skull, nose and lacrimal bone. Fig. 4. The lower jaw and place of attachment of the muscles to it (the outer surface, side view; b - the internal surface of the right half of the lower jaw): 1 - processus coronoideus; 2 - linea obliqua; 3 - tuberculum mentale; 4 - foramen mentale; 5 - angulus mandibulae; 6 - processus condyloideus; 7 - linguia mandibulae; 8 - foramen mandibulae; 9 - sulcus mylohyoideus; 10 - linea mylohyoidea; 11 - fossa submandibularis; 12 - fossa sublingualis; I - m. masseter; II - m. temporalis; III - m. pterygoideus lat. ; IV - m. pterygoideus med. ; V - m. mylohyoideus; VI - m. digastricus; VII - m. geniohyoideus; VIII - m. genioglossus. The lower jaw (Fig. 4). The body of the jaw (corpus mandibulae) has a horseshoe shape, walking away from it in the back parts of the branch (rami mandibulae). The body of the mandible bottom forms a dense region - base (basis mandibulae). In the anterior lower body jaw is in the form of rounded elevation - chin (protuberantia mentalis). Different people this elevation varies by shape and size. 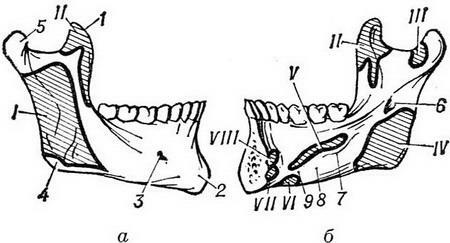 The body of the mandible without any boundary changes in the alveolar part (pars alveolaris). On the outer surface of the body of the mandible from the leading edge of its branches down and forward is the convex sloping line (linea obliqua). At mid-height of the body jaw between the first and second premolars is located chin hole (foramen mentale), through which open onto the outer surface of the jaw chin artery and nerve (a. et n. mentalis). On the inner surface the body of the mandible there are several elevations, employees of places of attachment of muscles. On the middle line has a bony protrusion (spina mentalis), to which are attached a chin-speaking (m. genioglossus) and chin-sublingual (m. geniohyoideus) muscle. Lies lateral from this mound is located fossa (fossa digastrica), where the front abdomen digastric muscle (m. digastricus). Further along the inner surface of the jaw is serving line (linea mylohyoidea)to which is attached oral sublingual muscle (m. mylohyoideus). Below this line is a small hollow, which is adjacent submandibular salivary gland. In the transition region of the body to the branch of the bottom jaw is formed angle of the mandible (angulus mandibulae). On the surface angle with the external and internal surfaces are rough edges corresponding to the places of attachment of the chewing muscles (m. masseter) from the outside and internal pterygoid muscles (m. pterygoideus medialis) with internal. Inside the body of the mandible passes mandibular canal containing lower alveolar vessels and nerves that go to the outside of the body jaw chin hole. Branch of the lower jaw is more thin and flat than her body. In the upper part of the branch - two sprouts, separated by tenderloin (incisura mandibulae). Ahead of it, there is coronary process (processus coronoideus)to which is attached the temporal muscle (m. temporalis). Behind the cut is articular process (processus condylaris), in which there are the neck (the word " Collum " mandibulae) and head (caput mandibulae). Ellipsoidal head of articular process together with articular surfaces fossa temporal bone forms the basis of the temporomandibular joint. Both joint (right and left) operate synchronously. On the inner surface of the branches of the jaw is temporomandibular hole (foramen mandibulae), leading mandibular canal. The various movements of the lower jaw are muscular apparatus with developed system of innervation. The blood supply of the jaws is mainly due to branches of maxillary artery (A. maxillaris), which departs from the external carotid artery. Lower alveolar artery (a. alveolaris inf.) departs from maxillary artery at the level of cervix of the articular process, then included in the temporomandibular the hole, and, passing through the same channel that provides blood supply of the jaws, teeth, gums. A branch of this artery, leaving the channel through chin hole jaw, is involved in blood supply to the soft tissues of the chin and lower lip. The top rear of the alveolar artery (a. alveolaris sup. post. ), departing directly from the maxillary artery, and the front alveolar artery (AA. alveolares sup. ant. ), the exhaust from infraorbital arteries that supply blood of the upper jaw and teeth. Vessels jaw have developed anastomoses between themselves and with other vessels of the face. The outflow of venous blood from the jaw is carried out mainly through pozavcherashny (v. retromandibularis) and partly facial (v. facialis) Vienna, unite in a common front Vienna, which flows into the internal jugular vein (v. jugularis int.). Popodrobnee, submandibular and deep cervical lymph nodes are the main, where the outflow of lymph from the jaw. In these sites, as a rule, first of all metastasize malignant tumors of the jaws. Innervation of the upper and lower jaws are the second (n. maxillaris) and third (n. mandibularis) branches of the trigeminal nerve (see).